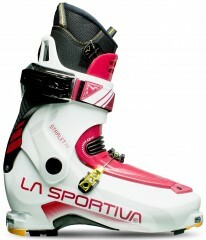 The Starlet is becoming the default choice for female ski mountaineers. The updated 2.0 version promises to continue that trend with a host of tweaks designed to improve your daily adventures. Pegasus buckles were added to fine-tune your ability to lock your heel in place. The lower shell has a redesigned shape that will fit more feet comfortably out of the box. A new insert system lets you step into just about any backcountry binding on the market. The Starlet 2.0 continues to offer the amazing 68° range of motion that enables you to walk or skin unimpeded. It also feature the one-motion ski/walk mode switch that enables you to transition unimpeded. And to ski unimpeded, the Starlet offers a sweet-flexing tongue supported by a rigid rear vertebrae for full transfer of power. It’s time to upgrade to the 2.0 version of you. EZ Thermo™ liner is form-fitting with skiing or a mold. Warmsole™ inserts insulate your feet from the cold. Fast Lock Closure™ simplifies transitions and thus life. Vertebrae Technology connects the lower and upper shell. S3 Inserts™ work with tech, frame, and TR2 binders. LazerGrip™ soles are grippy and easy to walk in. EZ Flex tongue flexes with your ankles as you stride. Pegasus buckles can be fine-tuned to your arch. Three forward lean positions help set your balance. I have an older pair of backcountry bindings (Fritchie Freedrider) and am wondering if these boots are compatible with them? I can't tell if the Starlets have enough of a lip on them to fit into the tip of the Fritchie bindings. Hi Melanie, yes, these can be used with tech, frame, and TR2 bindings. The Freerides fall into the frame category.